EA LOVES : #ealfridayfeaturing Sandie Dunne!! Hello lovelies so first we just want to say that we are taking holidays next week so there will be no #eal posting just for one week and then we will be back!! I first started crafting when was introduced to scrapbooking in 2006. Many over-filled albums later I put the 12 x12 layouts aside to concentrate on making mini albums as I was running out of space to store the 12 x 12 albums. Then I joined Blogger, was overwhelmed by all of the inspiration and talent out there, and in 2008 I bought my first rubber stamp and some distress inks.. and the rest is history, as they say. Friends who scrapbooked! I made some very good friends in the States and they introduced me to the world of hoarding papers and ribbons! lol. 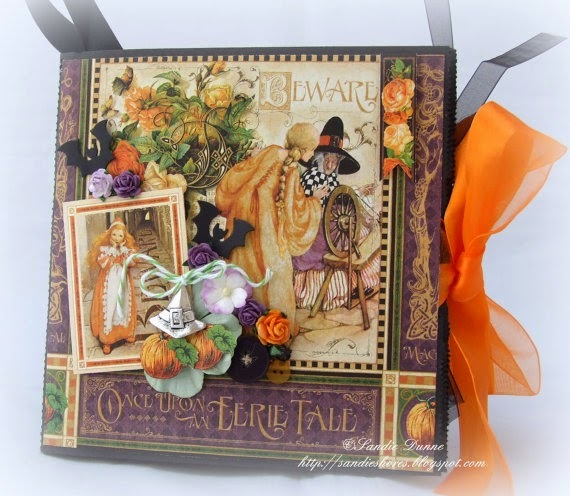 I learned so much from them as this type of scrapbooking wasn't widely known about, or practiced, here at the time. They also sent me loads of supplies, which weren't available here either. Flowers and pearls. No contest. I love love love my pearls. I bulk buy and just in case I run out, I have pearl pens in many colours. Wild Orchid Crafts and I am Roses are my favourite stores for flowers. I don't use as many paper flowers on my makes as I used to; I have an ever growing Die collection and I like to cut my own flowers. 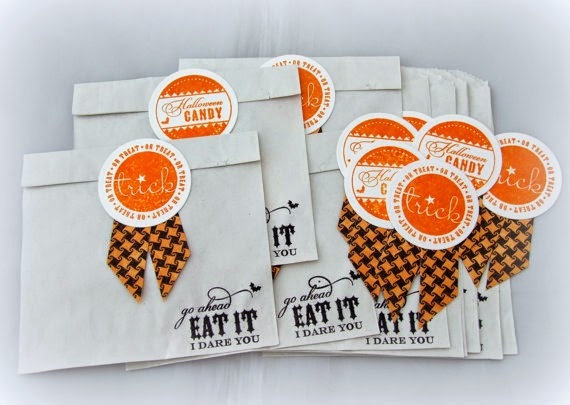 These halloween treat bags in Sandies store HERE are so cool-LOVE the sentiment!! 1.My Cuttlebug. I also have the Big Shot and the Grand Calibur, but my Cuttlebug has pride of place on my desk. Small enough to leave out and it does everything I need it to do. 2. Westcott Titanium Scissors - I've had it for years and it still cuts like new. It's quite small so it's perfect for fussy cutting. I used to be a huge Basic Grey fan, and I adore My Mind's Eye, but right now Graphic45, Prima and Kaisercraft definitely have the edge. If I were to pick one, it would have to be Graphic 45. Can I have make a list? There is a whole list of people I am inspired by daily. Mini Albums - Stephanie Miller. Not only does she oooooze talent, she also has a bubbly personality and her excitement is infectious through her videos. "Have a happy scrappy time"
Mixed Media - Gabriella Pollaco. I could watch her create art all day long. YouTubing while I should have been cleaning, lol. Copic Markers - Miss KerryJ, again on YouTube. She does AMAZING work with copics. .
Scrapbook Layouts - Marta Lapkowska. 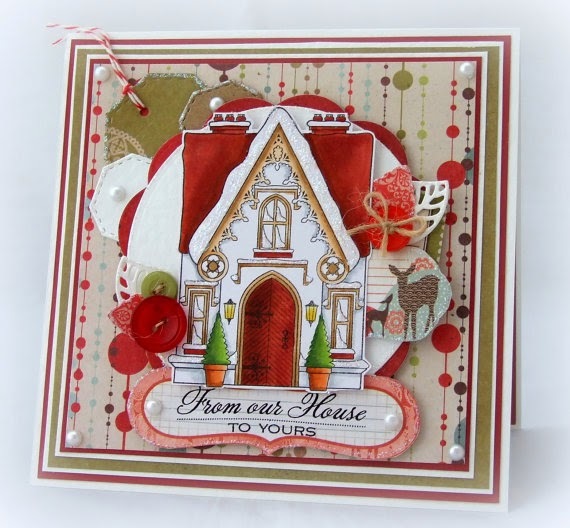 I am so very lucky to be on the Cardz 'n' Scrapz design team with her. Her layouts incorporate a lot of mixed media and I love her style. A newbie to YouTube but definitely worth checking out. Card Making - This one may suprise you. There are quite a few designers who inspire me but the first one who sprang to mind is Alice Wertz. She's typically a CAS cardmaker and that isn't really my style, but she just makes everything work. Her cards are stunning and they make me want to create CAS cards. 9. Favourite season or holiday to craft for? Halloween and Christmas! I love making albums, cards, gift boxes/bags and tags. We don't celebrate Halloween like other countries so I have a HUGE box of Halloween supplies if anyone wants them, lol. I have 2 and they are very recent. 1. A mini album using Graphic 45 An Eerie Tale papers. Love it so much! As long as I'm making something I am happy. My favourite project is the one I'm working on at that time. 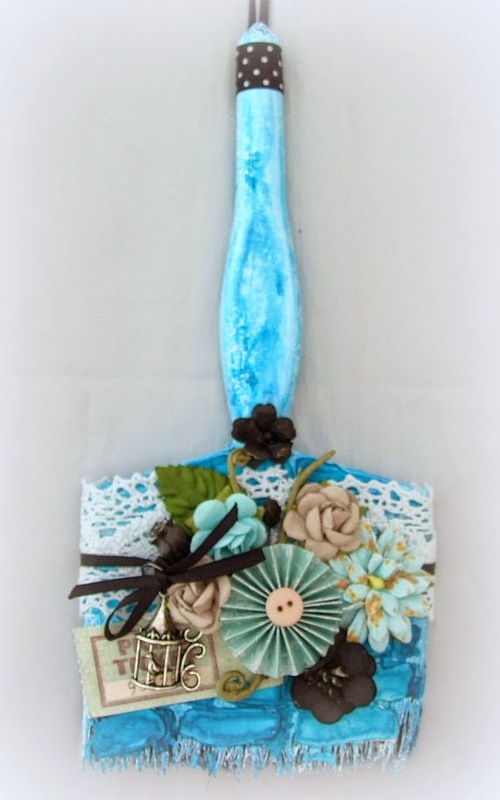 I have really been enjoying mixed media lately, and working with all of those fabulous products. As I'm taking some time out, to bring the little ones away before they go back to school, I am currently working production line style to get ahead of design team work and custom orders. Today I made 4 cards and, right now, I am working on 2 cards for the new La-La Land Crafts Kit Club. I am also working on my first magazine commission *nervously excited* which will be published in November. The one style I cannot master is Shabby Chic/Vintage. It defeats me every time. It's on my to-do list.. if I ever get the time. 15. Any funny crafting story to share? Oh gosh.. not really. I guess the funniest story I have is when I bought new boots and, wearing them for the first time, they really hurt one foot. I brought them back and explained that it felt like there was a pebble inside one of them. They replaced the boots and I wore them home. Again, they hurt one foot. I brought them back the next day and I took a refund rather than trying a 3rd pair. That night, while sitting on the sofa, barefoot, I noticed there was a flatbacked pearl stuck to the side of my foot..... I can really recommend those pearls - they don't fall off, even in the shower! lol. Thank you Sandie for completing our #ealcraftyquestionnaire, if you would like to do our questionnaire contact us! !